Everything has a time and purpose and I'm so glad it was time to let go. Every shelter is full and every bit helps. Yes, that is a wonderful thing to do. We shall be there to remember Sparkle as well. What a great thing to do, we will be remembering Sparkle too! Very nice of you to do. We will be remembering Sparkle too. What a wonderful thing to do to honor Sparkle's memory and achievements. I will be sure to stop over and leave a comment on Friday. Happy WW! We have sent a donation to Tabby's Place too in memory of Sparkle too. Very sweet way to honor her. Very sweet of you to think of the shelter for the food. I usually only adopt adult cats from shelters (I did allow my daughter once to adopt a kitten but the rest were mid-aged) and usually the ones no one wants. I can no longer adopt any more since I still have several older ones with many years left ahead of them, but I wish people would check out an adult cat when going to the shelter to get their family a pet. I did the same exact thing with Abby's food. I kept it for almost a year until I was able to let go of it also. So I understand. I don't know why some things we must hang onto until we are ready to let it go. What a wonderful thing you did donating Tara's food to her rescue organization. That is such a sweet idea, and we are sure it made Tara proud. 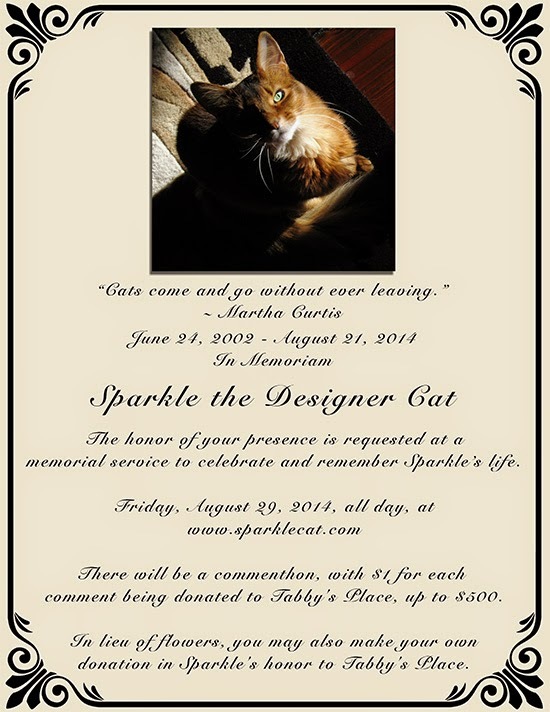 Sparkle's mom is also doing a wonderful thing with Sparkle's Memorial Service. 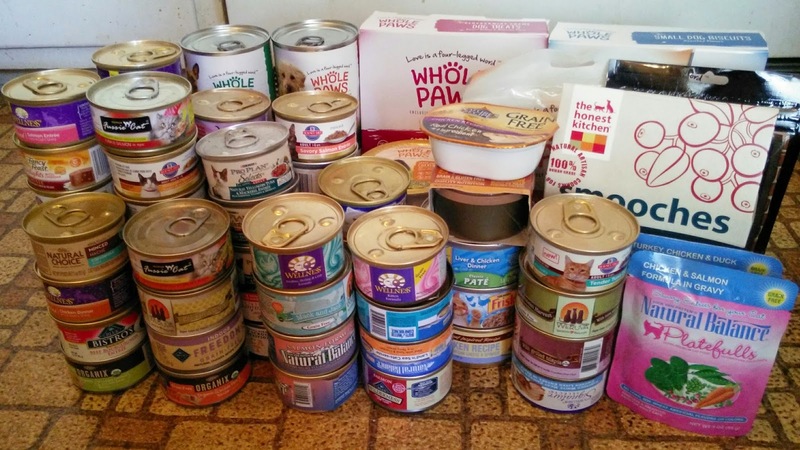 We love hearing about such generous efforts to help kitties in need! Aw, that is wonderful. What a kind gesture. What an awesome idea! My human had a lot of meds left over after Sparkle was gone, but she was so upset that she tossed them all - she didn't want any reminders of what Sparkle had to go through the last couple months of her life. She probably could have donated some of it, like the Pepcid AC (which it OTC) and the appetite stimulant. Plus the unused needles from the sub-q fluids. She just doesn't think sometimes. Thanks so much for spreading the word about Sparkle's memorial service - we really appreciate it! How very kind of you to donate that food. I'm sure the shelter was thrilled to get it too. I will be making a donation this weekend in Sparkle's memory. I like the idea of a commenton. It's always hard to part with those things that we associate as belonging to one of our pets that have passed, I did the same thing when I lost my beloved Rose in 2007. But, I am sure the shelter appreciated your generosity and it's a great way to honour Tara's memory. that is soo wonderful that you did that and I am sure it will be GREATLY appreciated!!! We donated to Tabby's Place yesterday....we will be at the commentathon too! Hooray! Glad to see that it will be filling the bellies of so many kitty friends! What a great idea! And an amazing way to commemorate our beloved Sparkle - love it. Great way to honor Tara. I don’t like fancy brands either. I’ll also be honoring Sparkle’s memory with the commentathon. What a lovely gift from Tara to the shelter kitties! Like many others, we have held onto food, medicines, and other things for a long time before finding somewhere to donate them. Letting go happens in odd stages sometimes. What a great thing to do! We will be there Friday too! It was wonderful of you to donate Tara's food to her shelter. I am sure the shelter was thrilled and Tara is proud of you. We will be at Sparkle's memorial service. This is such a heartwarming post and a beautiful gesture of generosity and love. That was so kind and generous of you. I've been using Rocky's food to feed our sickly fosters. I cried when I opened the first few cans, but I knew it was better to help them than to just sit. It's so hard and we totally understand.- Alana.